Wind tends to happen more higher up in the sky. You can build a windmill on a tall pole to capture the wind and generate electricity, but that means that you have a fixed location that needs extensive preparation, and the windmill is not going away for many years, so a lot of planning is required. But what if we could launch a windmill that would capture the winds at the same height as commercial windmills, but could be packed up in an hour or less, and be redeployed elsewhere? Enter the “Enerzeppelin”. The Enerzeppelin could be manufactured in different sizes, and in different configurations, depending on requirements and what investment people would want to make. The basic concept is that of a zeppelin-shaped gas balloon, with, depending on windtunnel and practical research results, either a tunnel lenghtwise through its center which would be fitted with one or more power-generating windmills, or several windmills deployed on a frame underneath or around the zeppelin, or both. The total number and wind-generating surface area of windmills deployable would depend on calculations and testing, and could vary depending on local conditions. In addition to the windmills, the upper surface of the zeppelin would be fitted with solar cells, to capture the rays of the sun. These cells would either need to be of flexible construction, or have sufficient space between them to allow for the zeppelin to be folded away for storage without breaking them. In some circumstances, such as where the Enerzeppelin will be redeployed and moved frequently, it may be more economical in terms of price/performance to mainly focus on the windmills, and not fit the solar cells. The overall concept would be as follows: the Enerzeppelin is deployed from either a building, a truck, a van, the bed of a pickup-truck, a trailer, or a (wheeled) crate, depending on its size. Where useful, the vehicles should be custom-adapted for the Enerzeppelin, to enable practical and quick launching and recovery. 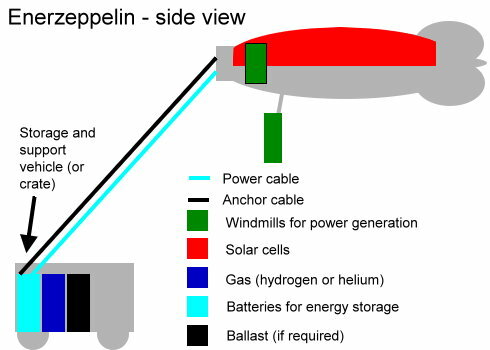 The larger versions of the Enerzeppelin would need to be anchored to a fixed object such as a building, whereas smaller versions, depending on wind conditions, could be anchored to a vehicle. In some locations, where this is easily possible, the vehicle could be fitted with inflatable ballast tanks, which could be filled with water pumped from streams or lakes with a handheld electrical pump, to provide extra anchoring security. For city use, a new anchoring system could be developed whereby a sewage drain is used for anchoring, by means of an expandable metal anchor being lowered into it, and expanded at the bottom (opening umbrella idea), which would lock it into place. Similarly, anchors could be developed to wrap around the base of light poles. Due to the cost of the gas to fill it with (hot-air versions, heated by solar power perhaps, could also be researched), there will be a minimum deployment period for the Enerzeppelin, below which it is uneconomical to use it, unless it were not deflated but simply towed, or parked atop a vehicle, for transport to its next deployment location. The gas to fill the Enerzeppelin with could either be hydrogen (which is cheaper, but flammable) or helium, which is more costly. The Enerzeppelin could be deployed permanently on some sites, although this would typically be remote sites such as farms, or remote industrial areas which are not subject to intervention from neighbours. Oil rigs out at sea could be equipped with them, and they could be used to power remote outposts of any kind. They could be deployed from ships or barges at anchor, and smaller versions, particularly if they were lifted using hot air, could be deployed to power small villages or individual homes or businesses in third world countries, or generally in remote locations anywhere on the planet. 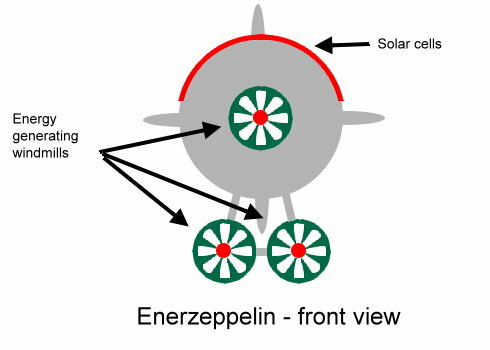 The vehicle the Enerzeppelin is deployed from would be equipped with batteries to store the power generated, and/or a system to feed the power into the grid or into direct usage. More advanced versions could use the power to generate oxygen and hydrogen from water, which could be used for energy generation using fuel cells, or the hydrogen could be used to keep the Enerzeppelin afloat. The latter would be very useful in third-world countries, as gas would be difficult to source commercially there, provided there is river water or similar to use. Enerzeppelins could be used to power events at remote locations, such as pop concerts, and they would also be useful in places where there is a sudden demand for power but no supply, such as disaster zones. Their easy portability in custom-designed vehicles or crates would make it easy for them to be dropped into disaster zones by helicopter. A small model should be able to power a set of freezers or fridges, as well as lights. 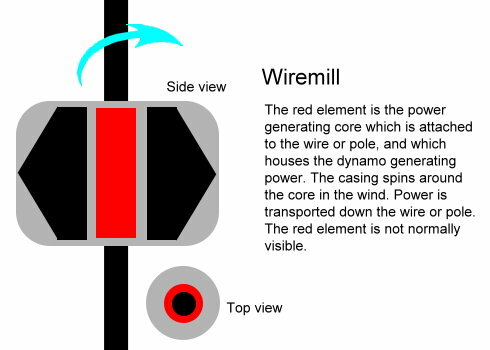 The wire with which the Enerzeppelin is tethered could be equipped with a number of Wiremills (see my separate post), to generate additional energy, provided the weight of the Wiremills is not too great. The concept of the Enerzeppelin is valuable because it will be readily deployable in any location globally where there is sufficient wind to generate electricity (the wind does not have to be strong, as the Enerzeppelin is attached to batteries, which will fill up over time regardless of wind speed). In areas where there is permanent wind, instead of a zeppelin-type balloon, a kite or glider could be used, which would do away with the requirement for the gas to keep it aloft. This would operate under the same principle.